We have installed the latest versions of the open source visualization suites: VMD, VisIt and ParaView. Notice that Niagara does not have specialized nodes nor specially designated hardware for visualization, so if you want to perform interactive visualization or exploration of your data you will need to submit an interactive job (debug job, see []). For the same reason you won't be able to request or use GPUs for rendering as there are none! request an interactive job, ie. this will connect you to a node, let's say for the argument "niaXYZW"
You can use any of the remote visualization protocols supported for both VisIt and ParaView. 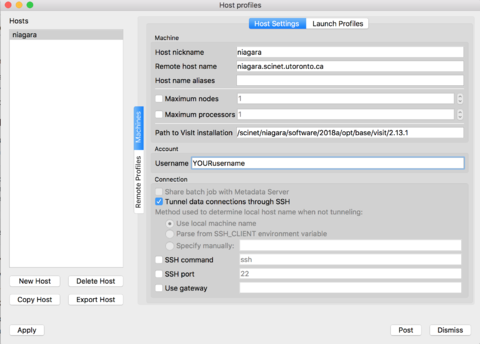 For allowing VisIt connect to the Niagara cluster you need to set up a "Host Configuration". Restart VisIt and check that the niagara profile should be available in your hosts. Click on the "Tunnel data connections through SSH", and then hit Apply! For doing so, click on 'New Profile', set the corresponding profile name, ie. login/slurm. 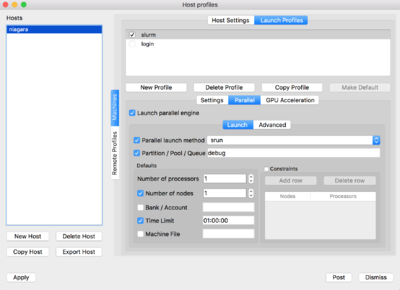 Then click on the Parallel tab and set the "Launch parallel engine"
Finally, after you are done with these changes, go to the "Options" menu and select "Save settings", so that your changes are saved and available next time you relaunch VisIt. The --mesa-swr-avx2 flag has been reported to offer faster software rendering using the OpenSWR library. Now, you have to wait a few seconds for the server to be ready to accept client connections. this will establish a tunnel mapping the port 11111 in your computer (localhost) to the port 11111 on the Niagara's compute node, niaXYZW, where the ParaView server will be waiting for connections. then click Configure, select Manual and click Save. 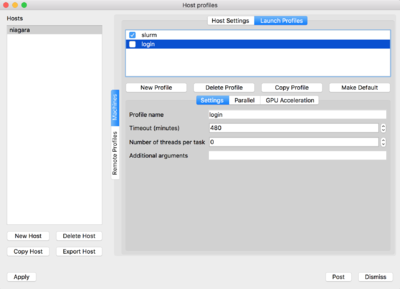 Once the remote server is added to the configuration, simply select the server from the list and click Connect. The first terminal window that read Accepting connection... will now read Client connected. Open a file in ParaView (it will point you to the remote filesystem) and visualize it as usual. Usually both VisIt and ParaView require to use the same version between the local client and the remote host, please try to stick to that to avoid having incompatibility issues, which might result in potential problems during the connections. Both, VisIt and ParaView, allow for batch processing using scripting in different languages. the 'engine_par' flag is needed in order to run the visualization engine in parallel. Notice that for running in parallel, in addition to loading the VisIt module, an mpi module should also be loaded. Eg. Alternatively you can try to use the visualization modules available on the CCEnv stack, for doing so just load the CCEnv module and select your favourite visualization module.